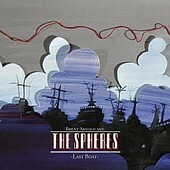 Late-night, indie-soaked pop music, with plenty of keyboards to give the songs a rich depth, Brent Arnold and The Spheres'Last Boat is a swirling collection of pop goodness. A well-written, nicely executed record that has its straight forward and quirky elements, but seems most at ease when blending the two for a unique, glorious sound that takes a minute to hit you, but when it does, you're all but a victim to its enticing sound. I'll give it a B+.